In Mexico, the Supreme Auditor of the Federation (ASF, by its Spanish initials) is responsible for public accounting audits. Every year, they publish audit reports on public programmes and works. These are an invaluable source of data that shows how the government plans, deploys, and operates programmes designed to deliver public services to the people. Through these, a relatively complete image can be constructed of how the Mexican government works, and how decisions that affect the everyday life of the citizens – both urban and rural – are taken. Our organization, ControlaTuGobierno (CTG) has been using these reports as a source of information for our workshops with grassroots communities. We know from experience that civil society engagement can play a very important role in enriching the work of the Supreme Audit Institution, in particular through social audits and through the tracking of audit reports on specific public institutions. From 2000 – 2016, the ASF carried out 222 reviews of the public works and programmes planned and operated by the National Water Commission of Mexico (CONAGUA as it is known in Spanish), and published the reports. Since 2014, we have conducted research reviewing all 222 of these reports – yes you read that correctly – including 31 reports on the performance of CONAGUA on Drinkable Water, Sewerage and Sanitation Programmes, which were studied in depth. We are now working on structuring the information contained in these reports, thanks in part to the ASF’s public system to consult the reports online. Our quest here was to find out what these audit reports reveal about the performance of CONAGUA. The initial questions set out were: How have the reports been used so far? How do marginalized communities effectively use this public information for active engagement? And does evidence gathered by civil society organizations complete the panorama that the official reports outline? Our experience shows that civil society engagement can play a key role to enrich the Supreme Audit Institution’s tasks, and contribute to tracking the recommendations they make about public institutions performance. The first approach of ControlaTuGobierno to this enormous amount of information was to focus on a descriptive analysis of the number of audits per year; the type of actions derived from the audit exercise; as well as the budget amounts audited and recovered. This allowed us to highlight findings about the most audited States, the number of recommendations made by the ASF, and the audited amounts. Many of the findings point to irregularities in the use of the budget. Along the sixteen years of audits analysed, the ASF asked CONAGUA to return the money related to expenses up to 75 billion Mexican pesos (around 6 billion US dollars) , of which only 740 million pesos (1 percent of this amount) were recovered. The lack of reliability in the information that CONAGUA offers as official data is even more alarming. For example, during 2011 the ASF highlighted that CONAGUA had no documentation and/or methodological evidence to support the improvement reported in their publication 2010 Situation of the Drinkable Water, Sewerage and Sanitation subsectors. According to their numbers, the access to drinking water increased 6% in 10 years and the sanitation coverage scaled from 79% to 96% in the same period. Considering the fact that CONAGUA does not consistently measure and produce this information, the fundamental question is what is the basis on which they plan and design their programmes. As another example, according to a 2014 ASF audit, CONAGUA agreed that communities in situations of extreme food poverty would be the target population of a programme designed to build sanitation facilities. However CONAGUA did not prove that it had any updated and disaggregated information to locate these populations in the territory. Our research also throws light on certain limitations of the financial auditing and administrative approach that the ASF uses to audit. This is reflected in a lack of sustainability, human rights and gender perspective criteria. A proof of that is the fact that the ASF approach considers water resources as a matter of national security rather than a human rights issue. Finally, our analysis shows that despite crucial institutional failures and irregularities – such as failure in fulfillment of programs’ goals, lack of transparency in selection criteria of projects, overall opacity and incomplete information of financial performance – being reported year after year, the recommendations from the ASF were ignored and the same bad practices continued to be documented in subsequent Supreme Audit exercises. Unloading dock of Poinsettia. Neighbourdhood of Caltongo, Xochimilco municipality, Mexico City. This picture was taken during a walk along the Avenida Nuevo León made with press and other media members to put in the public eye the misdeeds and problems caused by the repaving works. The works could have potentially caused damage to the drinking water network had the women of the neighbourhood not kept watch. These findings have shown that the water scarcity and pollution issues that we witness in our fieldwork with communities are the product of a series of fallacious administrative practices playing out at different governmental levels and therefore a deep-rooted and ubiquitous problem. As our work is directly connected with grassroots communities that have been facing multiple problems with the proper delivery of public services such as drinking water and sanitation, our experience has shown us that the access to official information – such as these audit outcomes – is essential to scale local demands to a higher level of government (either State or National). In 2018, Mexico went through a change in political administration. We believe that these findings, and the information contained on the reports, can help communities around the country to make proposals that encourage changes at the community level through better decision-making in the design and the use of available budgetary resources. Wastewater treatment plant. Cocotitlán municipality, State of Mexico. 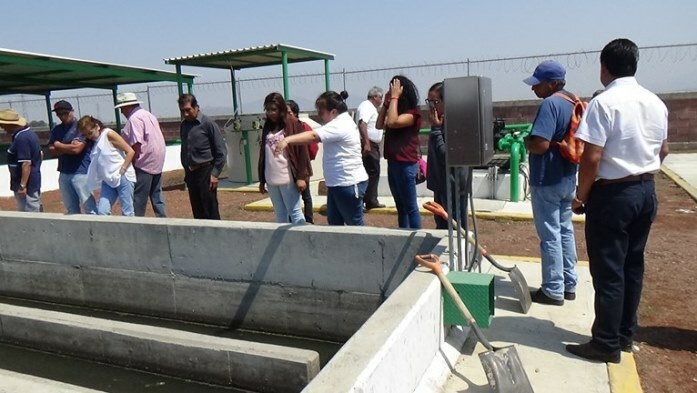 This treatment plant is one of the very few plants that operates in the Amecameca and La Compañía river basins. The plant was designed to help clean up these rivers. Although it works properly, the water that comes out of the plant is polluted again as it reaches the rivers, making the process useless. Crops irrigated with wastewater surround the facilities. The picture was taken during a visit with agricultural producers of surrounding fields. Around 6,168 million dollars, considering 1 dollar=12.16 Mexican pesos, the historical mean between 2000-2016 according to data obtained from the Bank of Mexico. The communities we work with are located in between Mexico City and the State of Mexico margins. 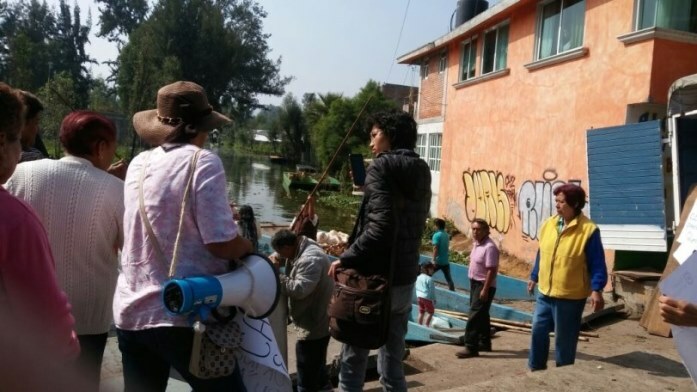 ControlaTuGobierno has been working since 2013 with grassroots communities, both, urban and rural, in different areas around Mexico City. Our main goal is to help marginalised communities to take control of the public decisions that affect their everyday life. We believe the right to information is a key that helps to open the gate to claim for other basic rights such as water and sanitation.